Back yard dangers – The Racoon! Raccoons are cute, but dangerous! Raccoons are curious and very smart wild animals. They are highly adaptable to living in cities, and near humans. 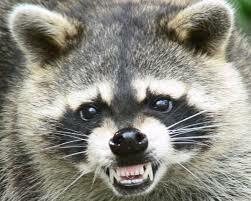 Raccoons often carry several dangerous diseases including rabies. it’s not something you want to risk! Raccoons carry two other diseases, roundworm and leptospirosis. And if you have pets, it’s possible for you to spread these disease to your cat or dog!